Do y’all know about Amazon mom? If you are a mom, dad, grandparent, or caregiver of a child you need to go sign up. You get FREE 2 day shipping and 30% off diapers and wipes. And it’s free to sign up. Nice! Remember the ridiculous restaurant art I showed you a little while ago? The dude had feet for hands. Well Gigi and I went back to the same restaurant for lunch again recently and I snapped a picture of our favorite vignette. 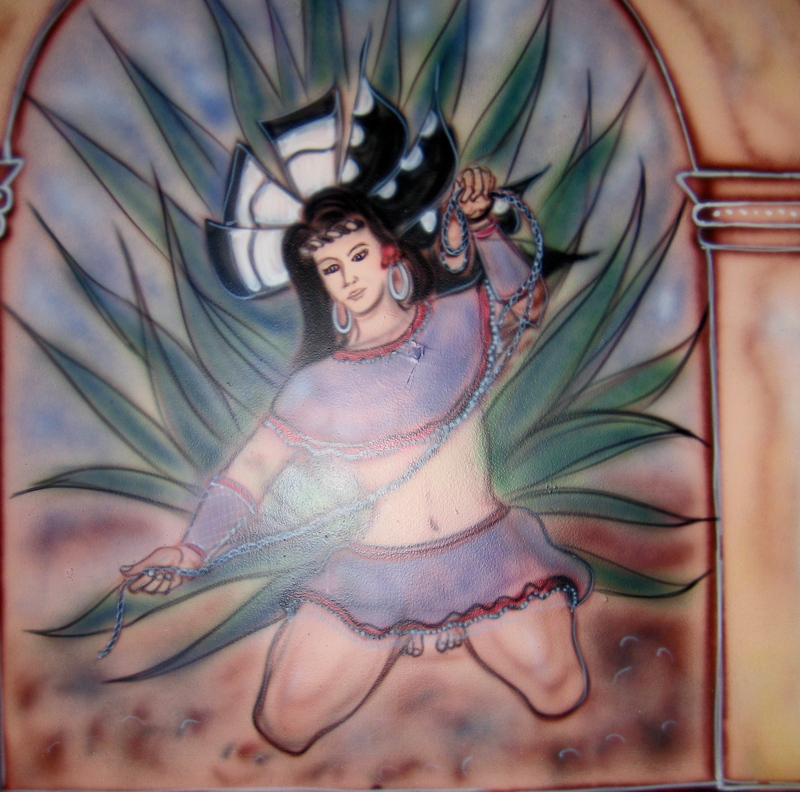 I totally get what the artist was going for, but when they tried to make it appear that she isn’t an amputee they gave her vaginal toe fringe. No one wants that. So distracting! Click to enlarge and behold her toe fringe in all its glory! 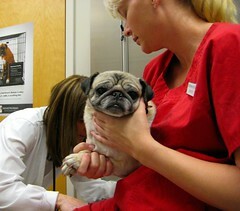 Every Spring we take the pugs for their annual vet visit. We’ve been going to our vet for over 12 years now! We LOVE our vet people. 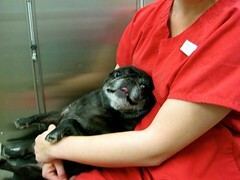 They love our pugs and really care about them. Even still, Kiki gets nervous. Here she is hiding behind CSP’s legs: Poor thing, she looks so miserable. But they take such good care of her and Kiki got a clean bill of health (besides her allergies)! Although now that she’s 7 she has to go twice a year. Being a senior citizen is tough! Then it was Molly’s turn. I love her bug eyes in this pic! She relaxed really quickly though! She’s so happy to get all that attention from her favorite vet ladies! Molly’s in perfect health as well. Zoe was up next. Can you tell she’s comfortable?? Just chillin like a villain! Zoe is turning into a little woman, but she’s still got TONS of puppy in her! 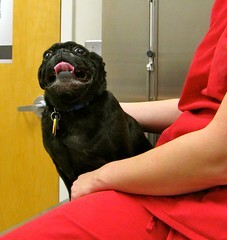 While we were waiting to pay I loved the image of my giant husband sitting with 3 tiny pugs at the vet! Can you get a Nobel Peace Prize for inventing this? Kiki is allergic to grass. She has to take a very large pill every other day. These pills are more expensive than any pill I take. Getting them down her tiny, obstinate throat has been a challenge the likes of which I’ve never encountered. We’ve tried EVERYTHING. Hot dogs, peanut butter, ham, tuna, turkey, cheeses of all varieties, marshmallows, basic shoving it down her throat, etc. The problem is that the pill stinks. So what we camouflage it with has to outstink the pill but still be small enough for her to swallow it because if she bites it it explodes and the liquid is very bitter and causes her to foam at the mouth and gag. It’s quite a production. I went to my Twitter and Facebook friends a while back and asked for help. Some people (forgive me but I can’t remember to whom [who?] goes the credit) suggested Pill Pockets. We finally found them at Petco. As CSP says “Boy, they sure know what to charge for these!” To which I reply “Yes, because someone tells them”. He loves that. We paid the painful $12 for an 8 oz bag of approximately 30 pill pockets and went home to try one out. Lord, please let this work I prayed as I molded the pill pocket around her pill. It seemed HUGE to me and it took her a while to get it down but SHE GOT IT DOWN. On her own! With no crying or cursing! The heavens parted and the angels sang! There have been some changes to the first pill pocket usage. 1. Those suckers are BIG. So now I just pull it apart and mold the stuff around her pill so she won’t have such a big thing to swallow. Works like a charm. 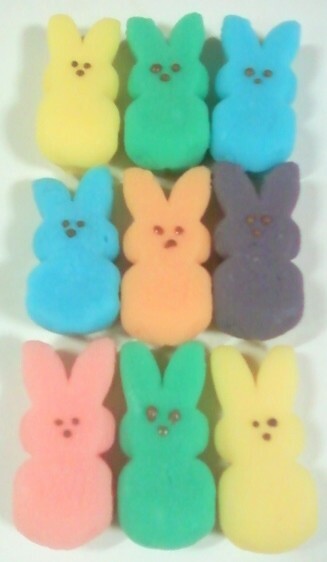 Plus, at 40 cents a piece plus tax this way makes it last longer. Kiki now actually comes running when I say the word “pill” or shake her pill bottle. Before it was a total spy mission. CSP would have to get the pill out of the wrapper thingy and pass it to me on the sly. We’d have to wait an hour before she’d stop being suspicious enough to come close enough to us to give her the treat wrapped pill. But now? Now I want to sing the praises of the Pill Pocket! 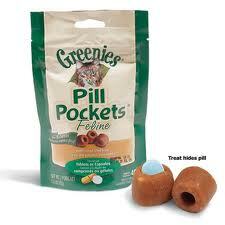 Everyone who has to give a dog a pill should buy these things! And Pill Pocket people? Kiki will never not be allergic and on meds so if you’d like to comp me a few bags I’d be forever grateful! You know that thing under your tongue? Well mine has been swelling up and hurting a good bit lately. 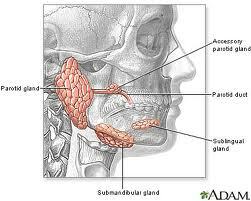 I asked my dentist about it and she poked around in there and told me that I have a salivary gland disorder. Wha? She said I may notice that thing under my tongue turn white. If that’s the case to go in because that means there’s a stone stuck in my salivary gland that needs to come out. Why can’t I have a normal dentist appointment? 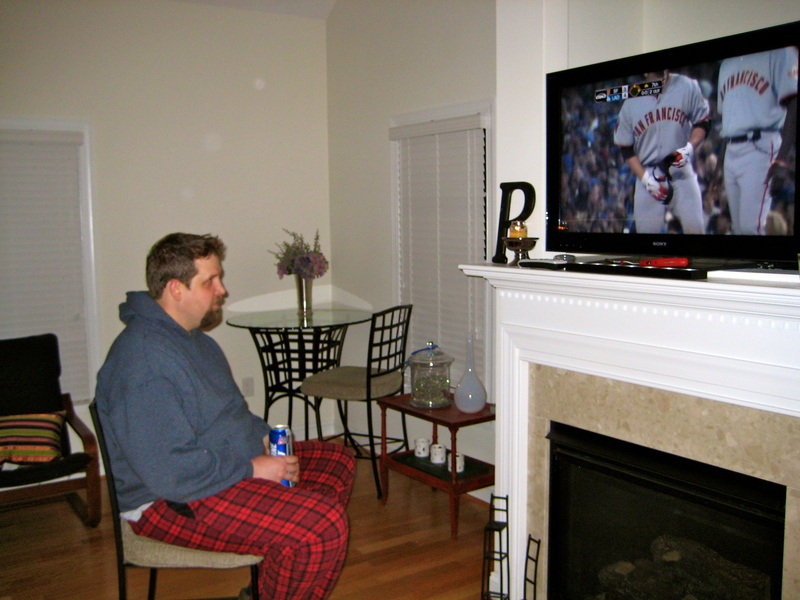 A few nights later I was getting ready for bed. My under tongue area was all swollen and hurting again. I took a look at it in my makeup mirror and noticed a part of it had indeed turned white from its standard angry swollen red. Well, I’m Southern and us Southern folks are known for some self surgery. It was late at night and I couldn’t wait until morning to find out what was growing in my mouth. So I grabbed my tweezers and out popped what looked like a giant sesame seed. I ran into the bedroom and tried to show CSP but he’d have none of it. I should have taken a picture but I was too busy playing with it. I tried to cut it in half and it shot across the bathroom, never to be seen or heard from again. It was rock hard! I guess that’s why they call it a stone! We were finally able to get a flat screen tv back in November (granted it’s only 3 inches bigger than our last tv, but we had tv niche size issues to deal with). You can see this tv from across the room easy peasy. Yet I’ll still find CSP standing right in front of it (like inches away) marveling over being able to see the blades of grass. I found him like this the other day. Mind you we have perfectly nice sofas he could be resting on!